We provide a REST API built on pragmatic RESTful design principles using simple and modern technologies. Our eSignature API uses resource-oriented URLs that leverage the built in features of HTTP. The request and response bodies are JSON encoded. 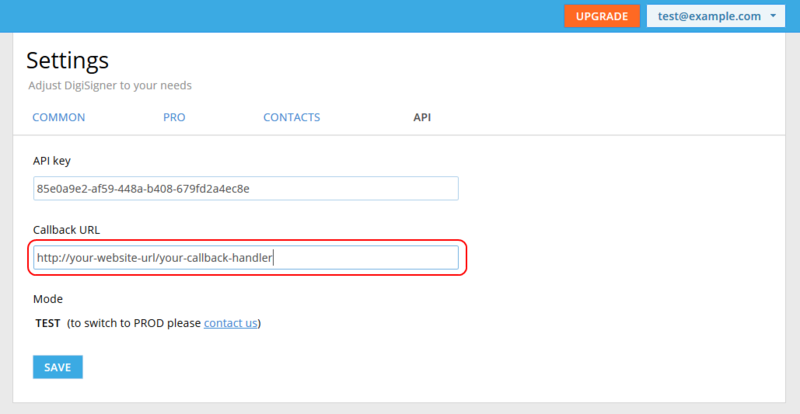 Any standard HTTP client can be used to communicate with our electronic signature API. Every DigiSigner account holder is issued a personal API key and can therefore start working with our eSignature API immediately. Please note that the initial API mode is TEST. In TEST mode, a watermark is automatically added to all uploaded documents. We will switch you to PROD mode when you purchase one of our DigiSigner API Subscriptions. Before you can proceed with collecting signatures, you must first upload a document to DigiSigner. If you are using our PHP, Java or C# client libraries, you can skip this step and begin sending a signature request immediately. Our client libraries will automatically upload a document for you in the background. The upload request returns the document_id of the uploaded document which you should use to send a signature request for this document or download it. Downloads the content of the document. Requires the document_id as a parameter. In the request, use the document_id that is returned by the ‘Upload Document’ request. The content of the file will be saved as document.pdf. The response then represents the content of the requested document. Initiates the signature process by requesting a signature for one or more documents. In the request, you can specify the email addresses of the signers for each specific document. For every signer you can specify fields for filling in. After sending the request every invited signer will receive an email with a link to the document to be signed. After clicking on the link, the signers will be redirected to the signature page, where they will be able to fill out and sign the document. embedded (optional) boolean Used when you embed documents on your web site (default: false). See here for how to embed documents on your website. use_text_tags (optional) boolean If text tags in documents are converted to fields (default: false). See here for how to use text tags in your documents. string Document id (returned by upload request) or template id. See here for how to use templates via API. array Array of existing fields for which you can set certain attributes, like content. Useful for populating template fields. The response parameters duplicate the request parameters, with the exception of sign_document_url. This parameter represents the URL of the signature page to which a particular signer will be redirected to sign a specific document. 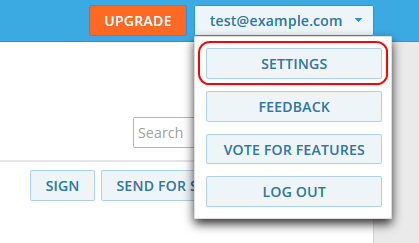 You can use sign_document_url, e.g., in the case, if you do not want DigiSigner to send invitations to signers via email (the request parameter send_emails is set to be false), but instead want your own system to send emails or even redirect the signer directly to the signature page. Returns information about a specific signature request, including the current signature status. Requires a signature_request_id. In the response you can see if the signature request has been completed (via the parameter is_completed) and if the single signers have signed the document (via the parameter is_signature_completed). Deletes document. Requires the document_id as a parameter. In the request, use the document_id that is returned by the ‘Upload Document’ request. The response has no content. Returns information about document fields, including content entered by signers. Requires a document_id. Downloads the content of the document attachment. Requires the document_id and field_api_id as a parameters. In the request, use the document_id that is returned by the ‘Upload Document’ request. The corresponding field_api_ids can be retrieved using the Get Document Fields request. The content of the file will be saved as attachment.pdf. The response then represents the content of the requested document attachment. If you need to be informed about the completion of the signature request, you can register for an event notification. To accomplish this, a callback URL must be specified in your DigiSigner account settings. 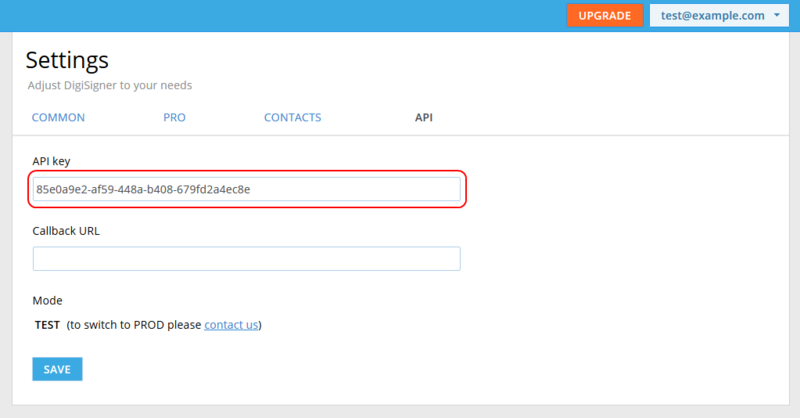 The callback URL will be automatically called by DigiSigner when the signature request has been completed, that is, when all the documents have been signed by all the invited signers. DigiSigner expects the response code 200 from your callback code, and the response text should be ‘DIGISIGNER_EVENT_ACCEPTED’. Otherwise, DigiSigner will repeat the callback request in 5, 20, 65, 200, 605 and 1820 minutes. Please don’t hesitate to contact us in case you have any questions or suggestions about using our electronic signature API.